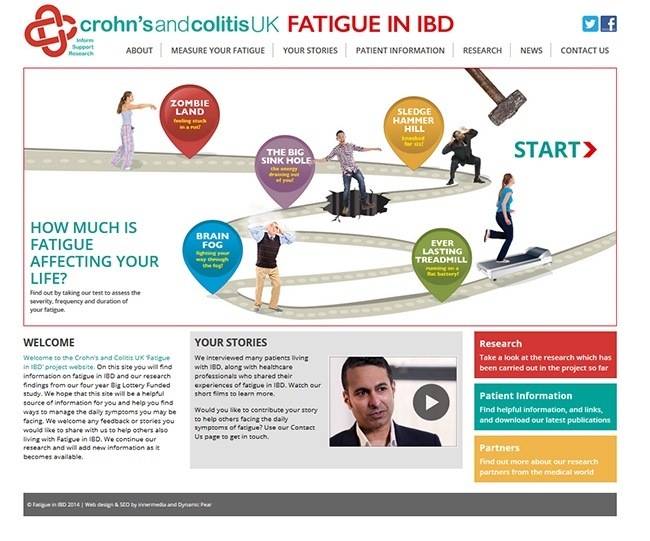 We are proud to have just launched the new IBD Fatigue responsive website design for the UK national charity Crohn’s and Colitis. We have worked with the charity for over 5 years helping them with micro websites and online customer questionnaires. We worked alongside London based design agency Dynamic Pear to create a very attractive, responsive and functional site to help IBD suffers understand their condition and help them to measure their own personal fatigue scale. The online tool provides scale ratings based on the data entered, advice on the level of the condition and lets the user email their results to compare at a later date or to show their local GP. Innermedia optimised the website with the latest SEO practices and are now in discussions with the charity about video production, social media and on-going help and support. For anyone that suffers from on-going fatigue or an overwhelming feeling of exhaustion we would recommend that you take part in the self-assessment – you can take part online or download a paper version. Your results will not be stored. Click here to take part in the IBD Fatigue Self Assessment. As a digital agency we are pleased to have been involved in creating the first every scale that has specifically been developed for IBD.